In 2002 I met the most amazing vet, Bruce Niland, who worked at the local practice in Gordons Bay. He introduced us to Maxine, the Boxer who stole my heart, and saved her life when she jumped at a glass window. However, very shortly after Maxine cut her paws to shreds Bruce and two of his friends decided to buy their own practice in Strand which left me in a conundrum. I continued to take the dogs there for serious problems, like when Patch (our Jack Russell) needed to have her eye removed but not for when our dogs needed their annual injections. This all changed when I took Patch to the local vet in Gordons Bay in 2013. She has a lesion on the remaining eye and without paying any attention to the eye, the vet told me I must put her down. I went home in tears, determined not to listen to the vet, and clear up the lesion as best as possible. A few months after this, we got a new dog from the animal welfare and she went to the same vet for spaying. This is part of the conditions of getting a dog from them. The vet failed to check her temperature before operating, and she was deathly sick. So. from that moment on I decided to take all the dogs to Bruce for anything and everything. Last weekend James told me that Toffee, their ginger caramel Pomeranian cross Jack Russell had been to the local vet in Gordons Bay and needed surgery. I immediately suggested we go to Bruce for a second opinion. So Carli and I took Toffee and Patch to see Bruce. Patch still has the lesion, and Bruce has given her a cream to put on when necessary. But other than that she is in amazing condition for a 13 and a half year old dog. After giving Patch her injections he took a look at Toffee and told Carli that they needed to do surgery. But that the surgery was more complicated than the other vet had said. I am so glad we went there, as his partner Faure is a specialist for the surgery Toffee needs, and he will get the best care there. I served the caramel with the gingerbread I made, as well as some ice cream. How shocking that one vet seems to be all about just putting beloved pets down. Lucky uou have another vet you can trust. 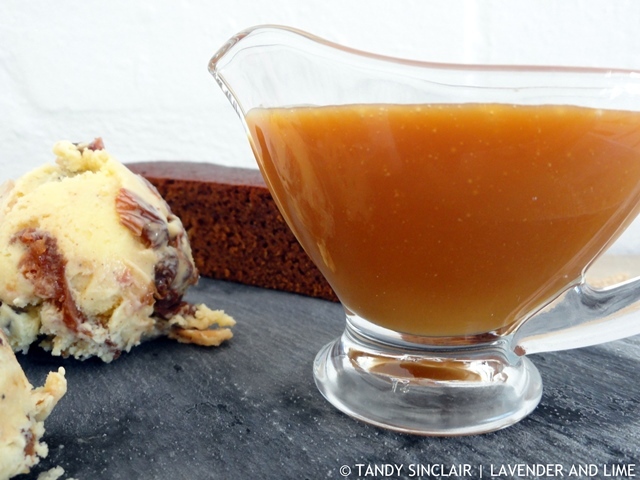 I do love this recipe – ginger and caramel, what a great combination! The vet really did not have a good approach to care! I know how close you can be when it comes to our doggies as they are like family so glad you found someone who can help your poor little guy. Ginger caramel sounds warming and delicious and boy would that be good on top of vanilla ice-cream or even on an apple pie. Sounds like a yummy sauce! It looks precisely divine Tandy and I love that it is a recipe for Toffee. Cheers to good vets. Ginger & I have a good thing going on lately, so Id love these too. A good vet is such a treasure, Tandy. We’ve needed our fair share of them with our animals, and thankfully they’ve been great. Great idea to add ginger, I bet it gives a little kick away from the usual cloying sweetness of caramel! YUM!! What a great recipe!! I love caramel! 🙂 Chewy and creamy and so satisfying!! Mmmm – delicious – Tandy – so glad you have such a good vet, it is so important, it’s just like having a good human doc. I adore ginger and it sounds so perfect for spicing up some caramel! This ginger caramel sauce sounds like it’s going to hit the spot ~ what a creative and interesting combination! Love the side of ice cream of course. My parents are Jack Russell people, they recently adopted a Jack Russell who was just abandoned by the side of the road. People can be so cruel. This dog feel into the honey pot and is not spoiled rotten but it’s frustrating that people can be so awful. And I can sympathize on your vet dilemma, they’re expensive and you have to find a good on! So tough. How wonderful to have a vet that you can so completely trust. The other one doesn’t sound like he has much of a manner at all! Yes, some vets (and Doctors) could do with a better bedside manner. Why did they get into the business in the first place? You’d hope it was because of their love of helping animals (or people) but sometimes I think they’ve forgotten that. As to the sauce – no doubt hugely calorific but also hugely delicious! I made mango & ginger ice cream on the weekend. This sauce would be lovely with it. The caramel would have been perfect for your ice cream! Love the idea of a ginger caramel. Have a wonderful and happy week ahead Tandy.